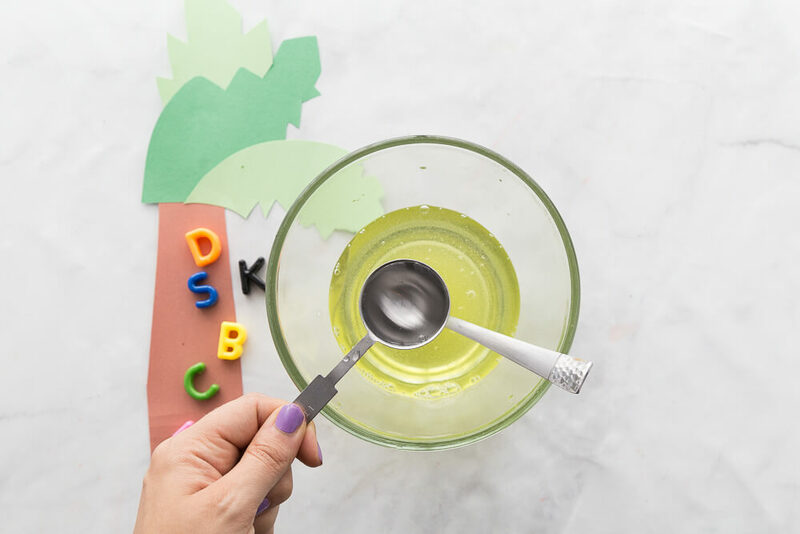 Combine science and literacy into a hands on learning activity all about letters with alphabet slime! 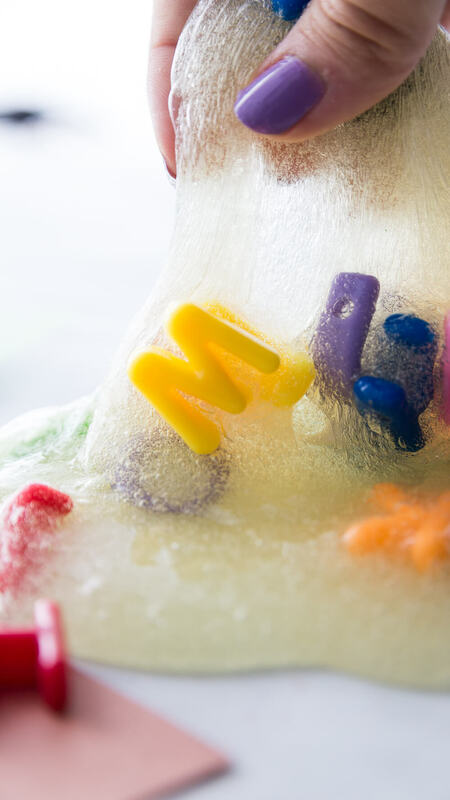 A favorite kid’s alphabet book is transformed with an easy homemade slime recipe! You can take any of your favorite alphabet based books and create this easy slime letter making activity for the kiddos to use for early learning and play. Making slime is a snap when you have the best slime recipes to use! How many different mix-ins have you tried with our basic slime recipes? 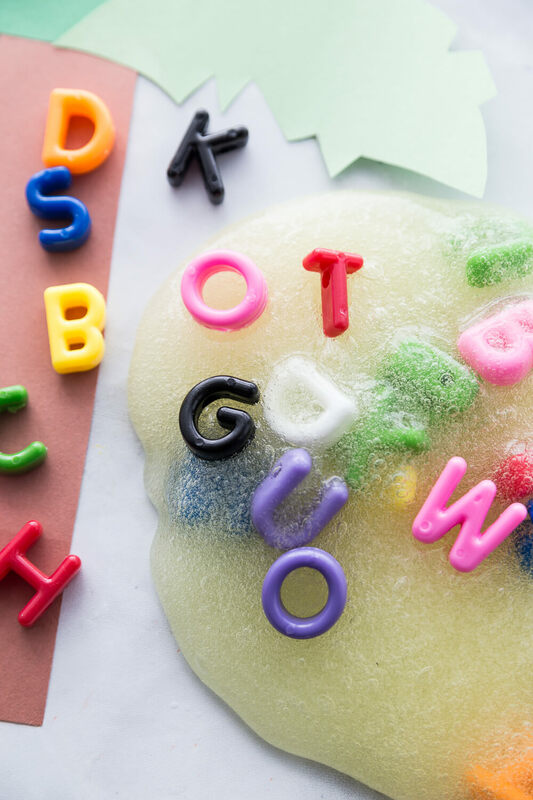 From gold leaf foils to beads to soft clay to chalkboard paint and now letter beads, there are a gazillion ways to make super cool and satisfying slime recipes with the kiddos. This new slime recipe will be sure to please the learning side too. Slime making is always a huge hit with kids. Our Alphabet Slime Recipe is yet another AMAZING slime recipe we can show you how to make for a fabulous early learning activity. No one wants to be sad and frustrated when they get the chance learn how to make slime…. OUR BASIC SLIME RECIPES ARE THE BEST SLIME RECIPES YOU NEED TO GET STARTED! Oh and slime is science too, so don’t miss the great information on science behind the slime. Want to see how slime fits into your classroom? Click here>>> NGSS Science Standards. SLIME SCIENCE, EARLY LEARNING, AND FUN! We always like to include a bit of homemade slime science around here, and that’s perfect for STEM which is science, technology, engineering, art, and math. We have a brand new series out on NGSS science standards, so you can read how this will fit in nicely too! Slime really does make for an excellent chemistry demonstration and kids love it too! Mixtures, substances, polymers, cross linking, states of matter, elasticity, and viscosity are just a few of the science concepts that can be explored with homemade slime! Read more about slime science! By adding alphabet letters (upper case and/or lower case), you will create a wonderful hands on learning opportunity for our youngest slime fans and new readers! Slime is already such an AMAZING sensory experience. Pairing it with an early learning activity like letter recognition is a natural fit because kids love to explore. 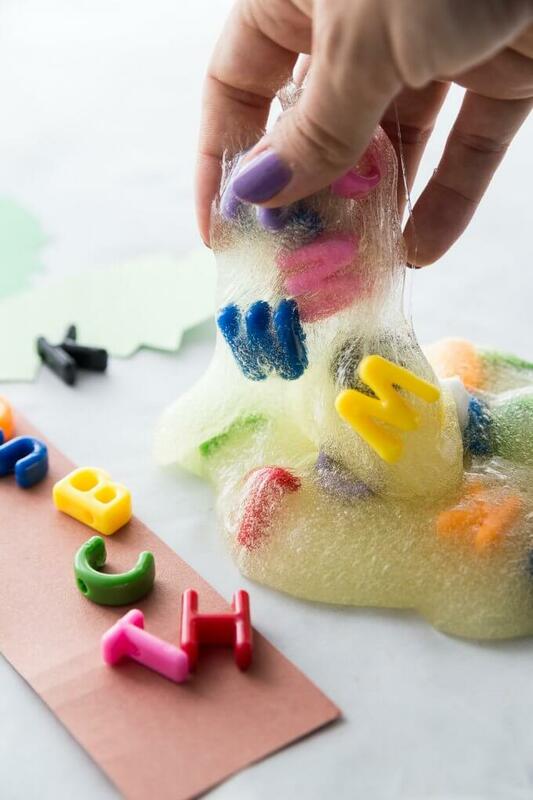 Our alphabet slime is perfect for little hands to do big exploring! Have you also considered the great fine motor skills involved with searching for letters and pulling them out of the slime? You now have combined a bit of science, literacy, and fine motor skills all in one! You can use just about any alphabet book with any theme. My son always loved construction alphabet books. Use a plastic dump truck to collect letters and add little pebbles to the slime. Want to use a Halloween theme alphabet book? Change the color of the slime and add plastic spiders! Do you have a princess fan? Add faux gems and a bit of pink food coloring (or favorite princess color) to the slime! For Chicka Chicka Boom Boom, make your own palm tree and laminate it! Slime can be sticky/wet so considering laminating any paper materials you use which also can help for reusing with other kids. Have your kids search through the alphabet slime to pull out letters to add to the tree. You can then go over the letters they found. Can they spell their name? You can also call out a specific letter for the kiddo to find and show you. Alternatively, you can write letters on a sheet (or on the tree) and have them match letters pulled from the slime to the letter written down! Best of all slime adds a playful element that creates an engaging environment for learning and an excited kiddo! We have more fun ways to explore the alphabet and letters here. Elmers glue slime is super easy to make, and the best part is the versatility of our basic slime recipes. Once you learn how to make slime, the themes are endless like this fun Chicka Chicka Boom Boom alphabet letter slime. The base for our slime recipe uses one of our most basic slime recipes which is Elmers clear glue, baking soda, and saline solution. 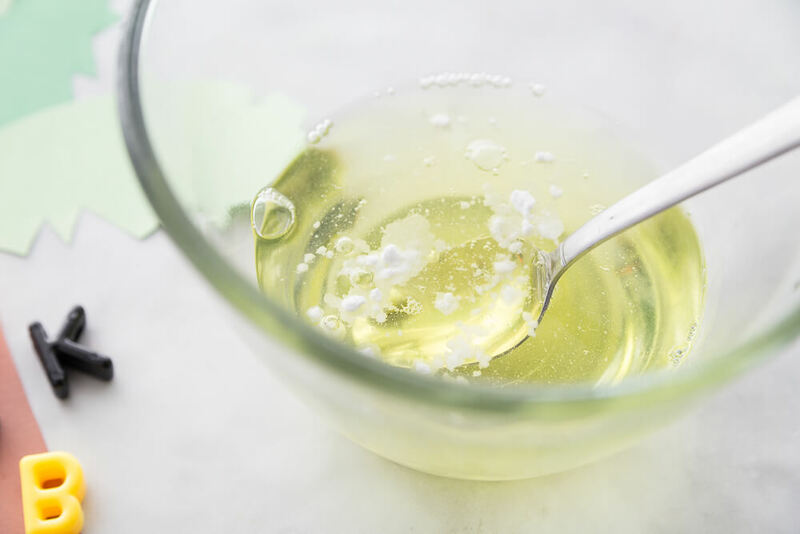 Now if you don’t want to use the saline solution slime recipe, you can absolutely test out one of our other basic recipes using liquid starch or borax powder. However, we find the saline recipe is perfect for UK and Canadian slime makers too! Our easy, “how to make” slime recipes will show you how to master slime in 5 minutes! We have spent years tinkering with our favorite 4 basic slime recipes to make sure you can make the BEST slime every time! We have the best resources to look through before, during, and after making your alphabet slime! You can even read about slime science at the bottom of this page as well as find additional slimy resources. As I mentioned above, you can use any of our basic slime recipes for this cloud slime, but we like this easy saline solution slime recipe with the Elmers basic clear school glue. I will link the products we used here with Amazon affiliate links. I highly suggest reading through our recommended slime ingredients and supplies page to check out all the best ingredients for making slime. The best alphabet slime recipe starts with the right alphabet slime ingredients. Make sure to follow along with our measurements. Start by adding your clear glue to a bowl and mixing in the water. If you want to make a larger amount of slime you can easily double or triple the recipe. Additionally you can add food coloring and glitter to your slime! Slime making is all about experimenting with your own personal creativity. 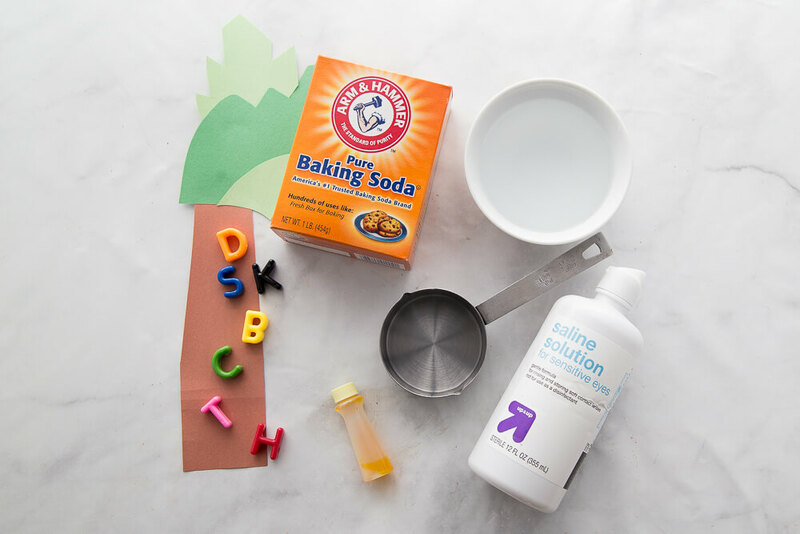 Add in your slime activator which is the baking soda and saline solution to complete the chemical reaction you read about above in the science slime section. If you scrolled past it, go back and read it with your kids! You can also learn more about all our favorite slime activators. Keep in mind that liquid starch, saline solution, and borax powder are all in the boron family. Neither of these ingredients are truly borax free. The first time you make slime usually needs some experimentation to find the slimy consistency that’s right for you. Slime making can be a bit like Goldilocks finding the right bed or the right porridge. Some kids like it messier and some kids like it firmer. Note: Liquid starch slime may appear stringy at first but give it a few minutes! Single Batch Recipe. Watch a full length video fo this slime being made on our main saline slime recipe page! STEP 1: Add 1/2 cup of Elmers Clear Washable School Glue to your bowl. STEP 2: Mix with 1/2 cup of water. STEP 4: Add baking soda and mix well. STEP 5: Add saline solution and stir until fully mixed and slime forms. 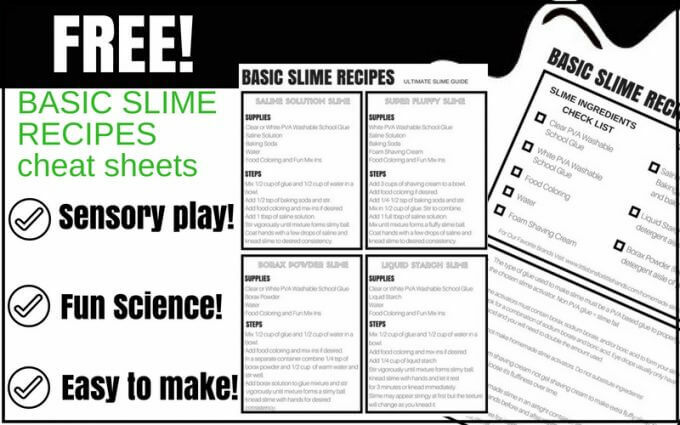 SLIMY NOTE: This is the stickier of our basic slime recipes at first. Be careful not to put to much extra saline solution on the slime after it’s made as it will continue to stiffen. Kneading really helps to eliminate the slime and you can knead in the bowl if desired. Squirt a bit of saline solution on your hands to reduce stickiness as you knead your slime. STRETCHY SLIME vs. STICKY SLIME ? A stickier slime will be a stretchier slime no doubt. A less sticky slime will be a firmer slime. However, not everyone loves a sticky slime! As you continue to knead the slime, the stickiness will lessen. Tinkering with the baking soda and saline amounts will change the consistency of the slime to thinner or thicker. Keep in mind that any recipe will come out just a bit different on any given day. This is really a great chemistry experiment, and one of the things you will learn is that slime is meant to be stretched slowly. Slime lasts quite a while! I get a lot of questions regarding how I store my slime. The slime containers we use are reusable containers in either plastic or glass. Make sure to keep your slime clean and it will last for several weeks. I love the deli style containers in my recommended slime supplies list here. If you want to send kids home with a bit of slime from a camp, party, or classroom project, I would suggest packages of reusable containers from the dollar store or grocery store or even Amazon. For large groups we have used condiment containers. Everything you need to know about making slime is below! Did you know we also have fun with science activities? Click on all the pictures below to learn even more great ideas for slime making. Check out more cool slime recipes and information by clicking on the photo below!